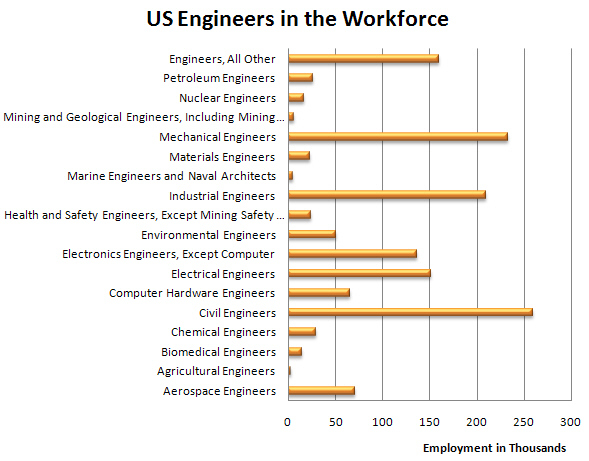 Time to look at the US Bureau of Labor Statistics Occupational Outlook for engineers in 2010. The Occupational Outlook Handbook usually does a decent job at giving a very brief overview of a position, the number of people employed in the field, and an extremely rough estimate for median wages. They do statistics by metropolitan area as well which made it really unique and useful before salary websites started cropping up everywhere. 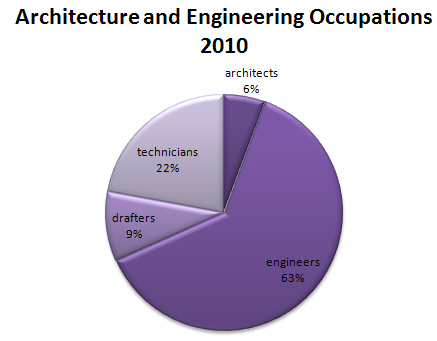 One thing I don’t like is how the BLS decides to split up different engineering occupations. For instance, there’s aerospace engineer but no automotive engineer. 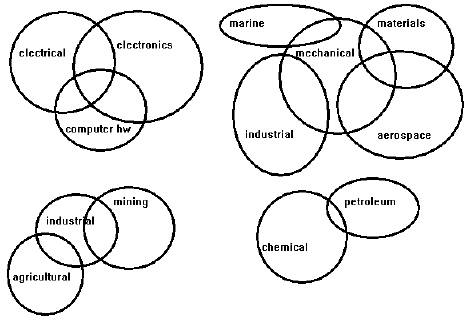 Would someone who changed fields into aerospace consider themselves still a mechanical engineer? How about someone whose field was chemical engineering but got a job in the oil industry as a petroleum engineer? I just think there’s too much overlap in their categories which could make these numbers a little unreliable. But what’s kind of interesting on the way BLS categorizes these jobs is that in a larger category it includes drafters and technicians as well. 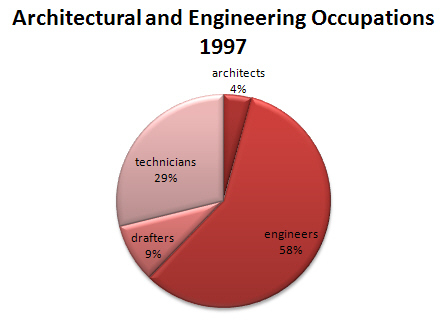 I was looking at the breakdown of how all these jobs contribute to the larger engineering job category and wanted to see if it had changed since 1997. In 1997 2.8 million people were employed in engineering in general compared to 2.3 million in 2008. The portion of the total force employed as technicians decreased while engineers rose. In fact total engineers employed went from 1.6 million in 1997 to 1.4 in 2010. But technicians employed in the industry decreased from 800,000 to 500,000. This could follow from the general restructuring of the economy in the same way we’ve seen a lot of manufacturing jobs disappear. So how are these engineers employed? Again it’s a little difficult to make extrapolations when some of the categories overlap each other, but you can get a general idea. 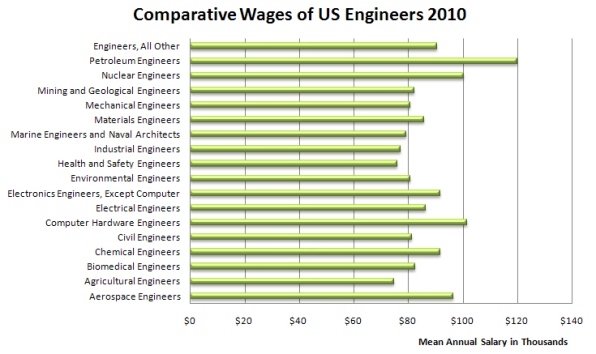 The thing that might indicate a precursor to demand would be average wages by engineering-specific field. Petroleum engineering seems to be the field to be in. These are average wages so you might expect peaks in metropolitan or higher cost of living areas and some amount of spread to entry level versus higher level. The BLS has a separate category for engineer management (which I’ve not included here, for the sake of brevity) so overall I’d say the wages look pretty good. And the most important figure, what does the BLS predict will be the growth over the next 10 years in these occupations. 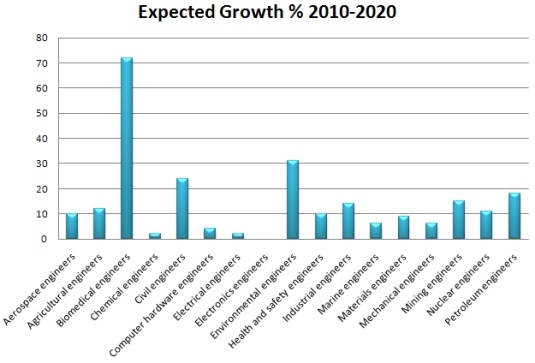 They predict an average growth of engineer of 11% and typical growth across all occupations as being 7-13%. Let’s break it down. So what to make of the BLS’s predictions? I have to say it seems a little optimistic overall that employment over the next 10 years would average so high in terms of growth. I know it’s dangerous looking at past data and extrapolating, but the past 10 years would say engineering employment stayed about level (or shrunk a little) and those in the engineer field who were not engineers took an even bigger employment hit. Engineers are being asked to do more, to handle tasks technicians might have been able to do before or to be responsible for their own CAD as well as leading designs. Obviously the numbers are affected heavily by the fact that 2008 was the beginning of a pretty strong economic downturn. So I suppose your outlook on recovery in general after the recession informs your opinion on how engineers will do. But clearly for the BLS there is a little of the glass half full mentality about. Wow…if those BLS predictions for the next decade holds true, things are looking pretty bleak for EEs (and I don’t mean Env. Eng.). Another reason I’d like to head to where the action is — China or India. I find the numbers incredibly hard to believe for the Electrical and Electronics industry. There must be some sort of massive industry that they are leaving out. Also, they are very obviously biased towards press on biomedical engineering. While I believe that it will be a growing field, I don’t believe that all of the growth in the field will be entirely people holding degrees with “Biomedical Engineering” on them. In reality, it will probably be mechanical, electrical, and materials engineers doing a bulk of the work in the field called biomedical engineering, but without the specialization that the degree implies. Building better prosthetics, improving MRI, and making better miniature sensors are all tasks that come to mind relating to the health industry, but not directly “biomedical engineering”. I feel like the same applies to the field of environmental engineers. mjcarrol – I agree and think that’s the problem with their job categories. Does an EE working in aerospace become an aerospace engineer? Or EEs working in biotech? It’s probably more useful to look at the overal 11% since across industry you end up with a lot of interdisciplinary teams developing products. In this economy, however, that seems overly optimistic to me. Especially since they have been telling us about how the baby boomer engineers were all going to retire and there’d be a shortage. If anything I’d say demand and wages have been driven down, so I’ll have to see this mass exodus to believe it. mjcarrol’s got it right about biomedical engineering in my opinion. I see plenty of people working in biomedical fields but they’re MechE or EE or MatSci. It seems to be the new flavor of the month. I suspect more people will be leveraging getting a more “generic” engineering degree in case the world finds a new flavor. I would always consider myself a MechE but my actual work is in a mechatronics group doing optics… Finding where people actually fit is much harder than generalizing with names. On the other hand, interesting info, if only to see rough trends. Environmental engineering actually is a field unto itself. In the past ten years, there’s been an explosion of degree programs in the field, so it’s relatively young. It is rather cross-disciplinary in focus given it combines water management, civil engineering, and geological engineering. However, people in those fields may not be able to easily enter into enviromental without augmenting their background.